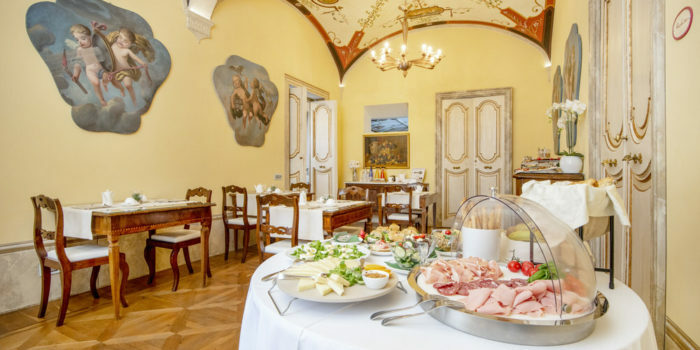 At “Relais degli Angeli” you will awaken to an unbeatable breakfast. A rich buffet full of extremely high quality local products will be waiting for you every morning, from 8:30 am until 10:30 am, in the prestigious “Sala degli Angeli”. The aristocratic hall or the romantic terrace that looks onto the city’s life will be the perfect setting for your breakfast, which can be enjoyed either outdoors or indoors. You will find homemade sweets and products suited to all kinds of dietary requirement or preference. Freshly-made orange juice, centrifuged seasonal fruit and vegetables, an entire table of salty delicacies such as Tuscan cheeses and cold meats, and many other tasty alternatives that complete our rich buffet. Celiac and vegan guests will also be able to enjoy a delicious breakfast characterised by the same high quality as the entire menu. And for those who love their privacy, breakfast can also be served in the room, upon request.